Drop off for tech services is completed in the Bunker pro shop on a first come first serve basis. Same day service cannot be guaranteed. Mail in option is available. Contact our technician for advice and determine if repairs are needed. If you are unable to drop off at the Bunker, simply include a list of technical issues you are experiencing, along with your contact information, and mail to our location for repairs. *Please include your contact information with list of technical issues your are experiencing. 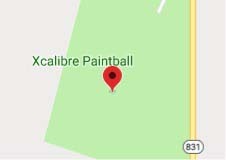 Products purchased at Xcalibre Paintball are subject to warranty provided by the manufacturer upon proof of purchase. Warranty repairs will be completed in shop on a first come first serve basis. Warranty is void for Products subjected to “abnormal use” which includes but is not limited to misuse, accident, modification, unreasonable use, abuse, neglect, lack of maintenance, improper installation, or natural disaster. Products are warrantied, at the time of sale, against defects in workmanship or materials that prevent their use. To claim warranty service on products please contact our office.